So I've been in need of a bit of normality recently, considering that my husband injured himself quite badly. As such, I apologise to those authors from TBRindr who may be waiting on a review and browsing my blog, I've been a tad distracted. In any case, I wanted something familiar, so Discworld it was. Soul Music follows a few different groups of people. Following the deaths of his adopted daughter and former apprentice, Death wishes to forget and avoid the process of grieving. Taking on his duty in his absence is his granddaughter, Susan, who has been raised largely away from her grandfather, in the hopes that she won't have to take up the family business. 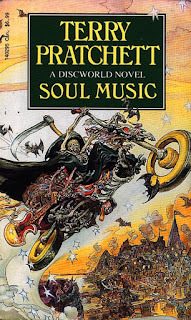 In one of her first jobs as Death, she comes across Imp y Celyn, a humble bard who has vowed to be the greatest musician in history, and in doing so has unwittingly made a pact with an eldritch guitar. And, of course, because his music is now somehow magical, the wizards get involved as several of them start acting unusual after being exposed to the music's power. 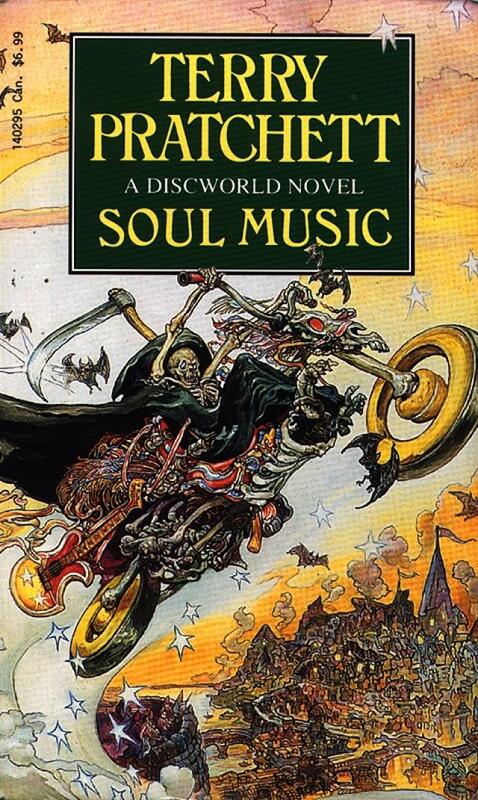 Several years ago, before I ever picked up any of the Discworld novels, by best friend convinced me to watch the cartoon adaptation of Soul Music. I remembered a couple of things about it when I started the book that it stemmed from. First, that Death will always speak with Christopher Lee's voice, because there has never been more perfect casting. Second, that this was the introduction of Susan, who I seemed to like at the time. Other than that, I couldn't really recall a great deal about the plot, only enough to know that I was really looking forward to reading the original source material. As such, I was a bit disappointed that it still doesn't beat Mort for best novel about Death so far. Much like Lords and Ladies though, that's not because of bad writing, but because the competition from other Discworld novels is so high. And there is so much to recommend Soul Music for. Susan is a bit more stiff than I remember her, but is still likeable and interesting to watch in Death's role, though she doesn't get as caught up in it as her dad did in Mort. Still love Albert, although his presence is fairly minimal in this book. The Death of Rats is properly introduced, and I love it so much. Probably the best part about Soul Music though is the way that the rock music community is so thoroughly and lovingly lampooned, with targets ranging from Elvis to overenthusiastic fans to bands who have spades more passion than talent, and, always my favourite, a surprising number of references to The Blues Brothers.